Leading Culture Change: What Every CEO Needs To Know is a practical guide for top leaders who are faced with the challenge of shaping their culture to create long term, sustainable value. Culture is changeable-but only with CEO sponsorship and a methodical, best practices approach. Author Christopher S. Dawson draws on 25 years of experience as an organizational consultant in a variety of industries to delineate five critical success factors, without which culture change is unlikely to occur. He offers practical tools and approaches to facilitate culture change, in addition to an overall framework that acts as a yardstick for seasoned and new top leaders. 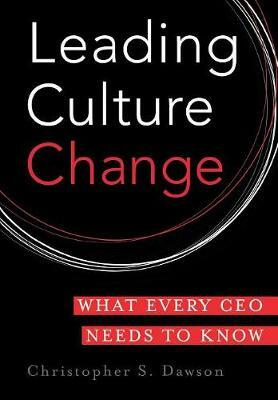 The book provides a "red-yellow-green" level of urgency tool for determining the degree of organizational effort required to address the gap between strategy and culture; a roadmap for culture change; and more.After describing how to effect change, the text describes frequent scenarios, providing guidelines, an in-depth case example, and lessons for top leaders. Finally, the book outlines four essential leadership competencies-dual-horizon vision; self-awareness; team leadership; and source of inspiration-based on the requirements for leaders of any transformation.This book is an ideal guide for today and tomorrow's top leaders-as well as a valuable supplement to management consultants' and human resource executives' professional training.